The mark of a true glassmaker is being totally smitten by a red-hot glob of molten glass. This was the reaction of Japanese glassmaker Ikushima Harumi when she saw the gathered glass at the end of a blowpipe coming out of a furnace for the first time. “I thought it looked like a beautiful glowing stone. I was very excited”, she recalls of the moment when her love affair with glass began. 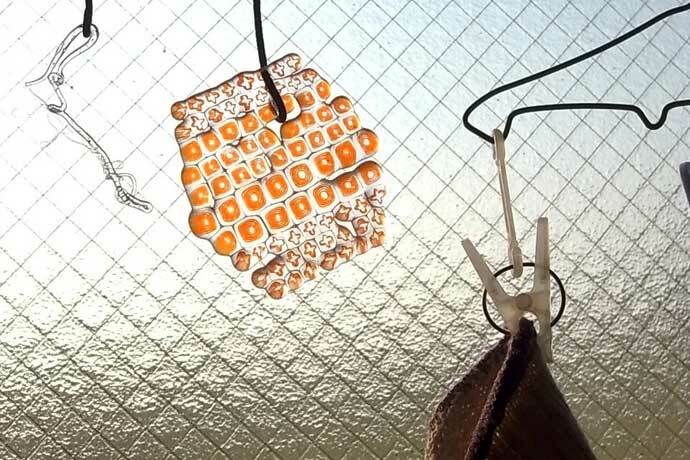 Harumi specializes in the elaborate Italian glass making technique known as murrine. The murrine process begins by creating a fused bundle of colored glass into a design and stretching it into a cane. The cane is cut crosswise to reveal the design and these pieces are called murrine. The murrine are then arranged into a mosaic, fused into a tile, and picked up with a molten glass collar and blown into a vessel. This blown murrine process that is used to create her footed cups is extremely complex because the murrine adds to the difficulty in creating a balanced and clean form. Uneven expansion of glass can also cause the pattern to warp. So how did Harumi master this composite process? 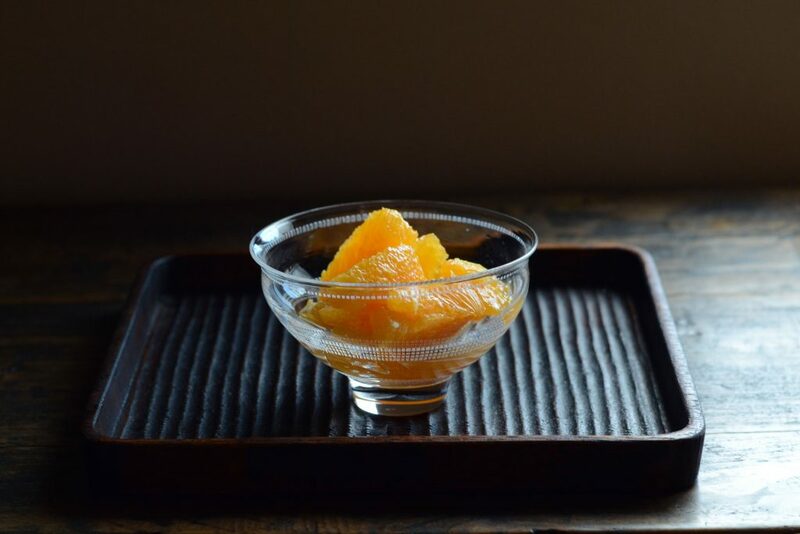 Harumi did not start out as a murrine glassmaker when she first entered the profession after graduating from Tama Art University almost 20 years ago. 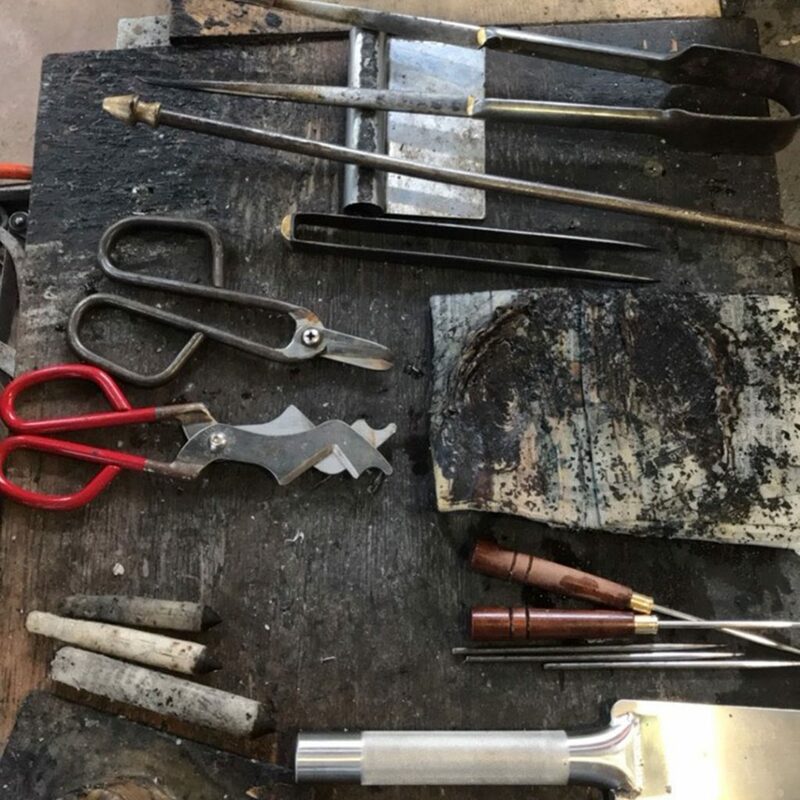 From the beginning, Harumi was curious to learn different techniques including lampworking, fusing, and casting that brought out different aspects of the beauty of glass. Close-up of the murrine cup. Blowing murrine into a balanced form is an extremely diffcult task. The equipment that was available to her also determined what methods she could use. 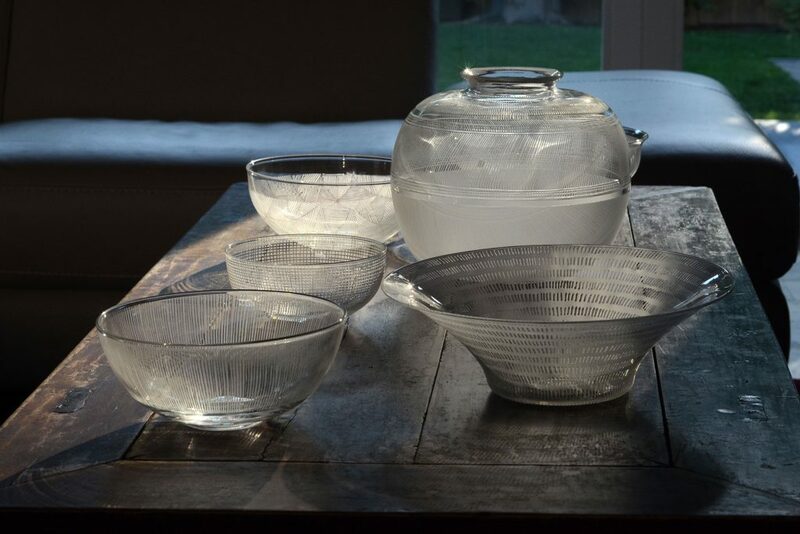 When Harumi’s glassmaker husband Ikushima Ken worked for the American glassmaker Dan Dailey at his studio between 1997 and 1999 near Portsmouth, New Hampshire, Harumi bought a little kiln that was used on the kitchen counter to make kiln-formed glass. After returning to Japan, the couple decided to build their own glass studio on the western coast of Izu peninsula in Shizuoka. 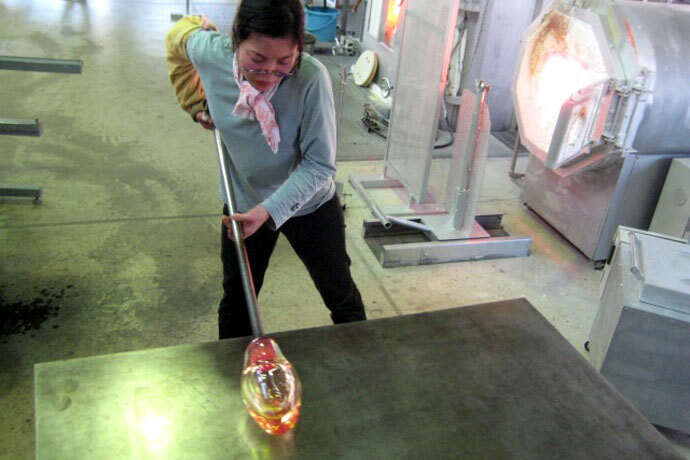 Since their studio was built in 2001, Harumi has been blowing glass more frequently. The glassblowing process requires an assistant, and Ken and Harumi help each other. So being married to a glassmaker has also allowed her to continue glassblowing. 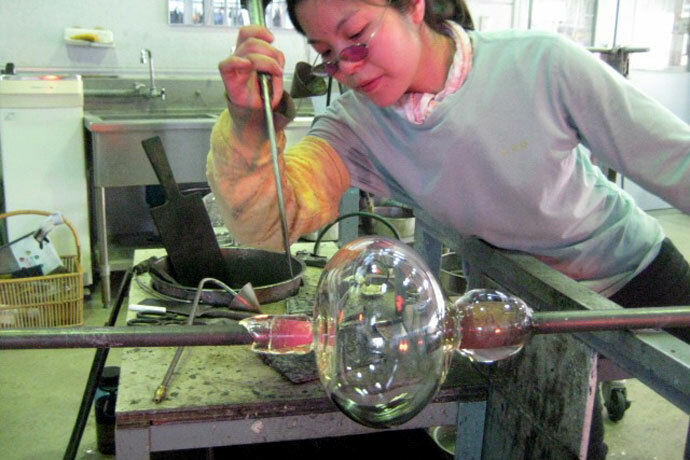 Harumi’s embrace of the murrine technique is likely the result of her experimentation with various methods of glassmaking throughout the years. 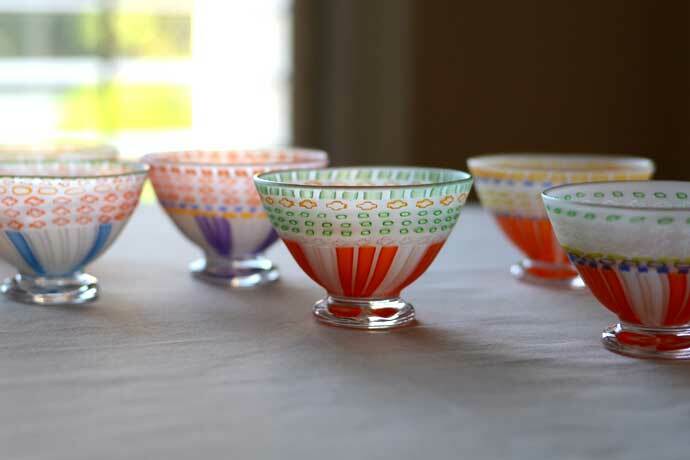 “Among the many steps of creating blown murrine, I especially enjoy the quiet part of the process, like deciding the color and design of the cane, or making the canes, then cutting and arranging the little pieces” she explains. The all-involving murrine technique is perfect for this multi-skilled glassmaker. The stylish beauty that defines Harumi’s colorful work clearly captures her spirit and the serenity that comes from someone who is so at peace and in love with her craft. There is no place to hide for an artist that works on handmade glass. The delicateness and transparency of the medium means that a maker’s lack of expertise, eye for detail, or even passion and dedication, are very obvious. Fortunately, Japanese glassmaker Nitta Yoshiko has these attributes in abundance. 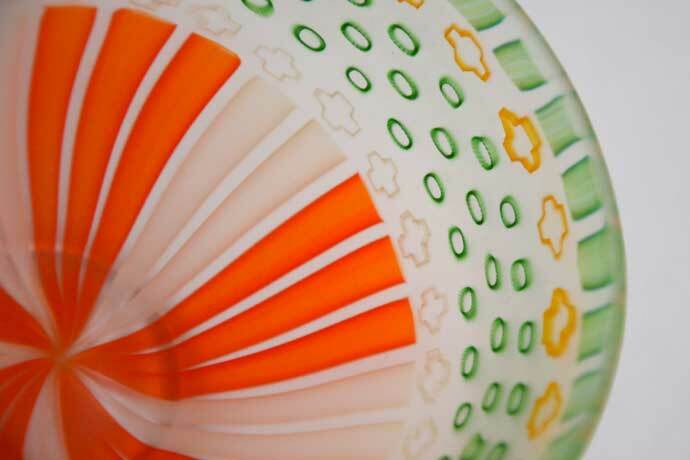 She is a master creator of mouth-blown glassware etched with delightful, intricate patterns. Her work possesses a unique contemporary flare that features a compelling contrast between its frosted and transparent elements. 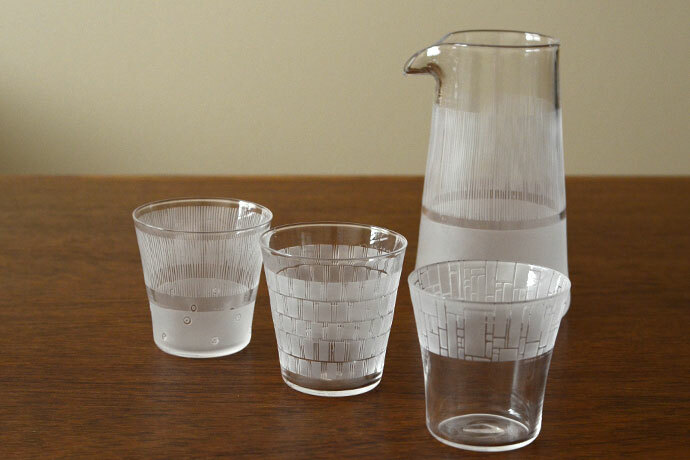 Yoshiko points out that “transparency is a special aspect of glass that other medium do not possess. So I want to create work that lets that characteristic shine”. I met Yoshiko at a craft fair in Osaka in the autumn of 2012. She made such eye-catching work that I wanted to find out more about this unassuming but immensely talented artist, and bring her work to the attention of a larger audience in the U.S.
From a very early age, Yoshiko had yearned to make a living as a craftsman. 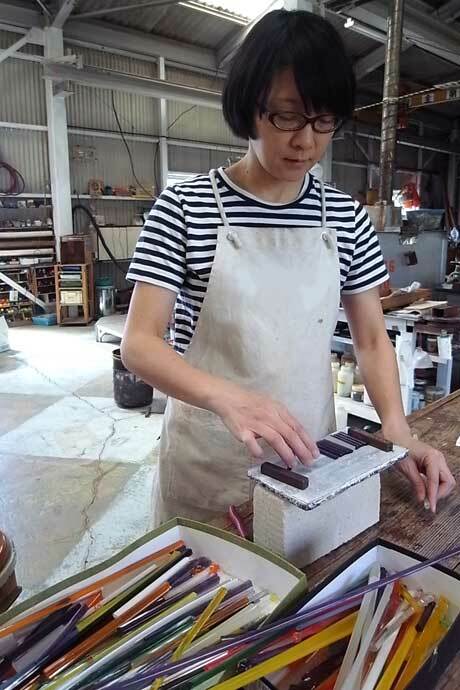 She wanted to follow in the creative footsteps of her father, who was an umbrella maker in Osaka. When Yoshiko was in high school, she visited a glass art show in Osaka and instantly fell in love with the glasswork of the internationally famous glass artist Iezumi Toshio. After discovering that Iezumi taught glass at Kurashiki University of Science and the Arts, she enrolled in the university to study under him and thus, he became her mentor. 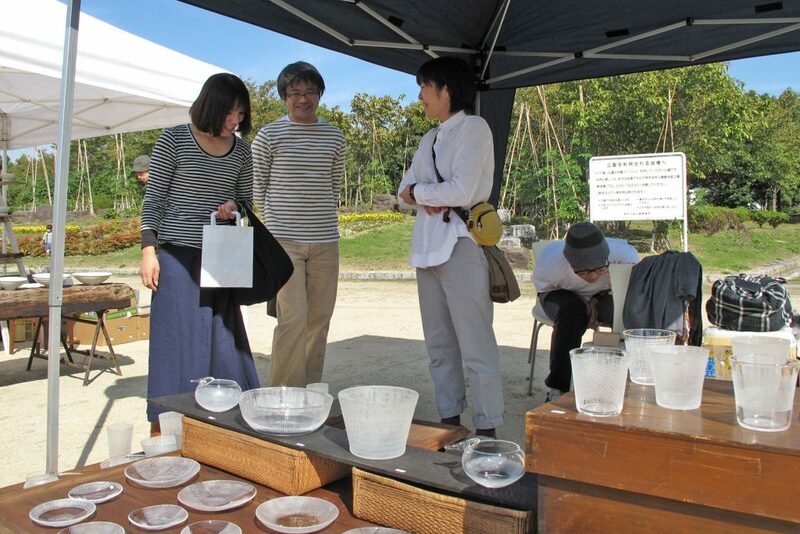 At the university, Yoshiko also had the opportunity to take classes with Kodani Shinzo, a well-known Mingei glassmaker from Kurashiki. This intensive training profoundly shaped Yoshiko’s views about what she wanted to do and how she would go about doing it. 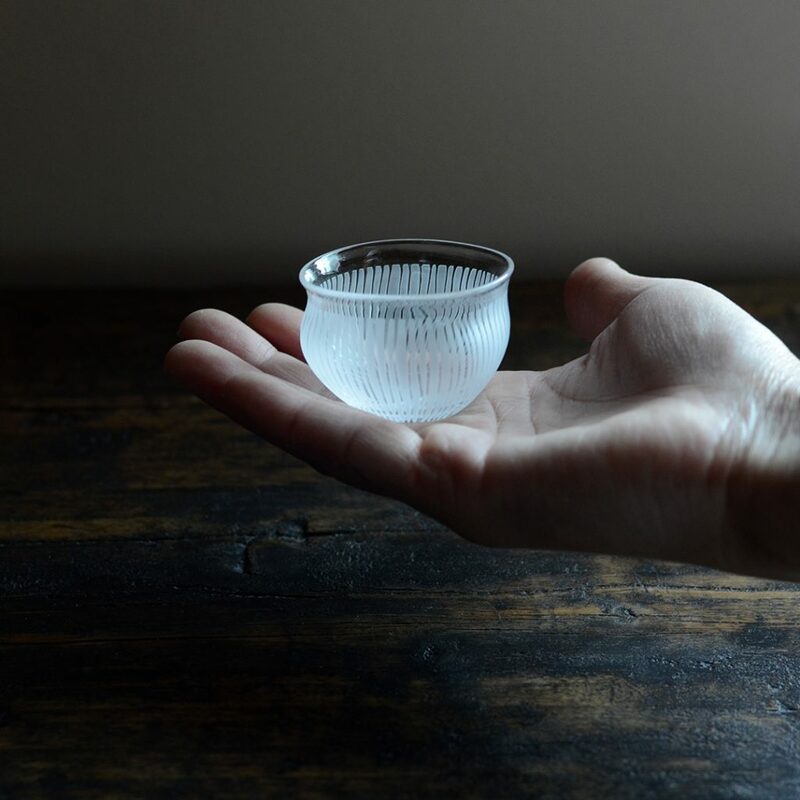 “After four years of studying glass in university, I developed a strong desire to create utilitarian wares out of glass.” Yoshiko has been doing exactly that by making glass objects for everyday use since her graduation in 2000. “I want my work to be used daily, so I pay special attention to the thickness, weight, and size of my work”, Yoshiko explains. Her glass cups have thin rims that feel good on the mouth. 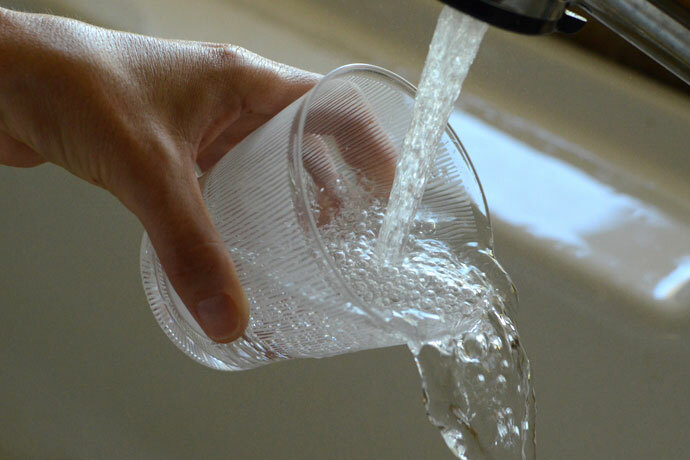 They are also lightweight and the etching on the glasses allows for a solid grip that makes them very comfortable to hold. Yoshiko puts considerable thought into the design and engineering of her work, always striving to meet her exacting requirements. Yoshiko creates her vessels through the ancient technique of free-blowing, a time-consuming process that adds to the charm of her work. 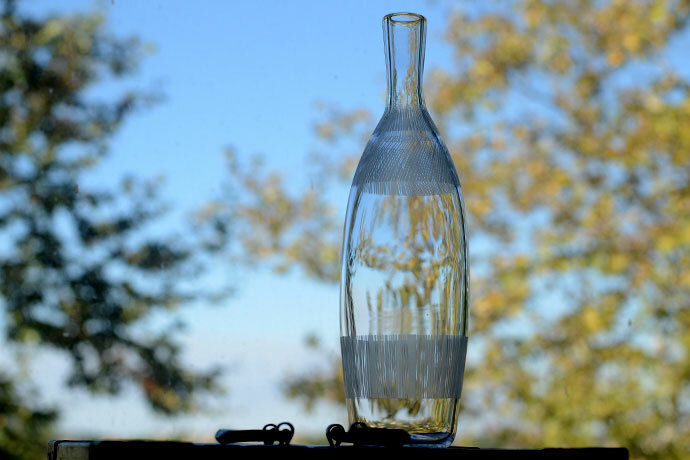 Free-blowing does not use molds and so requires skill and experience to manipulate the shape of the glass using centrifugal force and gravity. 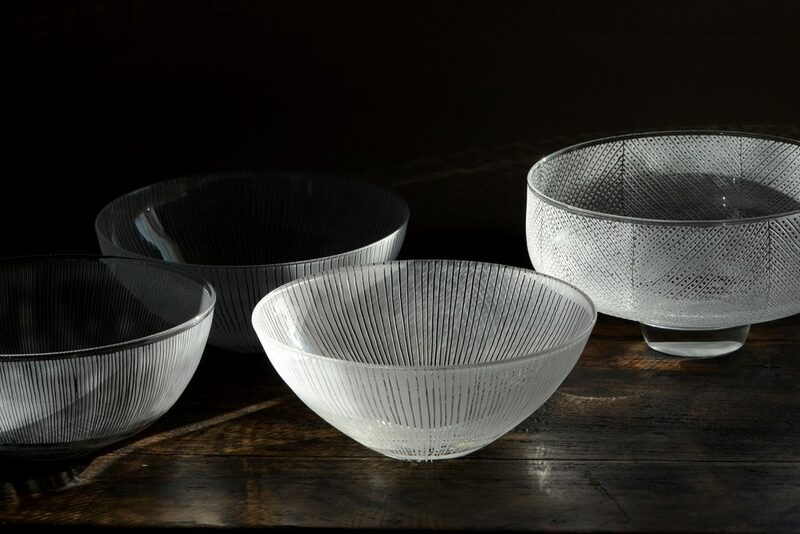 The slightly distorted transparency of blown glass and its gentle waviness has an allure that can be found in an old farmhouse window or in quiet ocean ripples. The effect gives a warm appeal that cannot be replicated in mass-produced work. 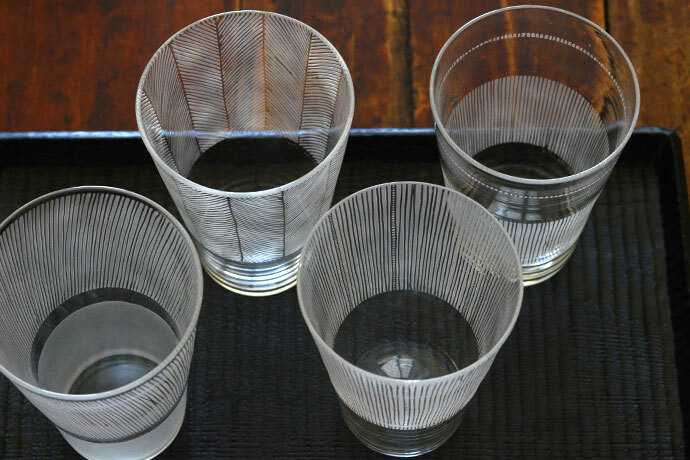 A hallmark that denotes the high quality of Yoshiko’s work is the detailed etching of her glass. She achieves this by drawing fine patterns directly onto the glass surface with a special glue resist, which is then sandblasted. The patterns are time consuming to draw but the results are outstanding. 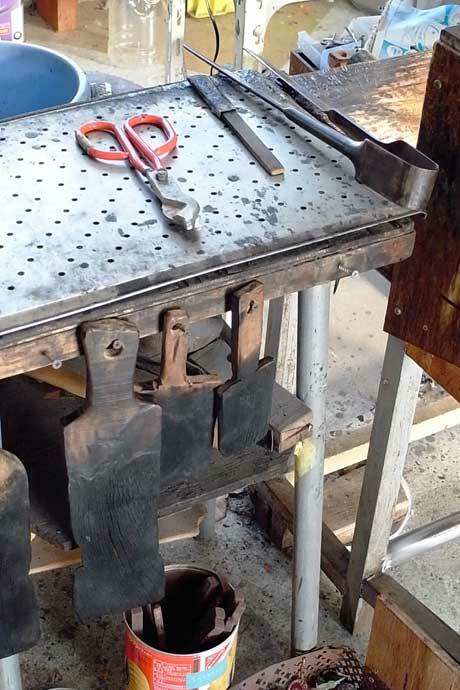 There is an often-heard argument that the nature of handmade craft requires sacrifices in engineering and usability. Yoshiko’s high-quality work and craftsmanship is an elegant counter-argument proving that this is simply not the case.